Following the success of Dark Horse’s latest Predator miniseries, Predator: Hunters and the excitement for September’s upcoming The Predator film release, the publisher will release of not one, but two Predator projects later this year! For fans craving new bloody action, writer and Senior Dark Horse Editor Chris Warner (the artist from the original Predator comics from 1989) returns to team up with artist Agustin Padilla for a blood-drenched adventure in Predator: Hunters II! Since the beginning of time, Predators have come to Earth from their home among the stars to stalk and kill the strongest of humans for sport. But now the tables have turned, and a group of human hunters has set their sights on the Predators. But they soon find out they are competing with a mysterious government agency that is after the same prey. The hunt is on, and only the strongest and smartest will survive! And for those who crave the blood-soaked nostalgia of Dark Horse Comics nearly 30 year run of Predator, we proudly announce Predator: The Essential Comics Volume 1 TPB! Before the 1990’s film Predator 2, Dark Horse released a full-color comics sequel to one of the greatest action films of all time written by Mark Verheiden and illustrated by comics mainstays Chris Warner and Ron Randall. This was to become just the beginning of an ongoing line of many Predator tales. Collecting Predator: Concrete Jungle, Predator: Cold War,and Predator: Dark River, Predator: The Essential Comics Volume 1 TPB is a value package for those who value action. Predator: Hunters II #1 goes on sale August 08, 2018. Predator: The Essential Comics Volume 1 TPB goes on sale December 12, 2018. The 368-page paperback volume is value priced at $24.99. “KILL YOUR DARLINGS” part three! Amanda Waller’s gone off the reservation! She’s ordered Task Force X to go full-on super-villain and take down the Justice League! No, not that one – they tried that before! This time she wants Batman’s new Justice League of America driven before her – dead or alive – and the Suicide Squad is happy to oblige. In the early days of the war on Cybertron, two leaders start down their paths towards destiny. Meanwhile, on current day Cybertron, Megatron is back! Everything Bumblebee and his Autobots have built teeters on the edge of collapse–and Starscream has to make the choice his whole life has been leading to. On the Lost Light, a secret prisoner is confined in the bowels of the ship. Collects the Monstrosity mini-series, Robots in Disguise #12–18, and More Than Meets the Eye #14–16. 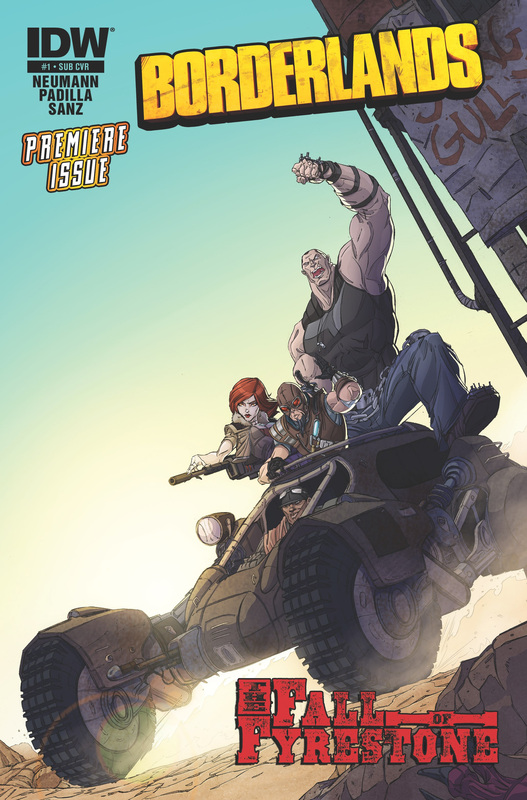 The critically acclaimed videogame series Borderlands, begins an epic new canonical chapter this July in the original comic mini-series The Fall of Fyrestone, from IDW Publishing. Returning to the strange and deadly world of Pandora are Roland, Mordecai, Lilith, and Brick, who embark on an adventure as bizarre as the planet itself! The new series welcomes back the creative team of the smash-hit Borderlands: Origins. Writer Mikey Neumann returns to Borderlands, having written not only Origins but also the original game. Agustin Padilla’s dynamic and eye-catching art will usher the hapless heroes through the new adventure. Transformers fans hungering for more thrilling adventures with Grimlock and his fierce Dinobots cohorts are in luck this May, when IDW Publishing presents Transformers Prime: Beast Hunters! In this tie-in series to the upcoming season of “Transformers Prime” television show featuring the new Beast Hunters saga, fans will get to experience a brand-new set of cyberfang-gnashing adventures based on the iconic brand from Hasbro! The lauded creative team from Transformers Prime: Rage of the Dinobots returns as writers Mairghread Scott and Mike Johnson team up with artist Agustin Padilla to chronicle the fierce Autobot warriors’ resistance efforts. IDW Publishing and Hasbro have announced the launch of two new comic book series: Transformers: Fall of Cybertron and Transformers Prime: Rage of the Dinobots. Together, these link Fall of Cyberton videogame with the ongoing story of Transformers: Prime animated series produced by Hasbro Studios and currently airing on The Hub TV network. Starting in August, IDW will bring a new digital comic with Transformers: Fall of Cybertron, a prequel to the videogame written by Barber with art by Dheeraj Verma . Fall of Cybertron tells the origin of the Dinobots—as they battle their way through Shockwave’s forces in a prelude to the game. The series will run for six digital-only installments on a bi-weekly schedule, and will be available on ComiXology and other digital platforms. In November, Transformers Prime: Rage of the Dinobots launches, linking the events of the game and Transformers Prime television series together. With Optimus Prime and the Ark long gone, the Dinobots are forced to confront Shockwave again—this time with the fate of Cybertron at stake. This mini-series will be written by Mike Johnson and Mairghread Scott, the writer of the TRANSFORMERS: PRIME animated series. Artist Agustin Padilla will take on the interiors while illustrator Ken Christiansen will provide compelling covers. Transformers Prime: Rage of the Dinobots #1 ($3.99, 32 pages; full color) will be available in November 2012.